Have you invested your surplus money wisely? Know exactly how much you'll have to retire on? Saving for a first home in Auckland? Got any idea how much money you would need to take time off to spend with a newborn? It's hard to get these sorted if you don't know where to start. That's why Lean In Auckland Chapter's second speaker event of 2018 is all about getting financially fit. 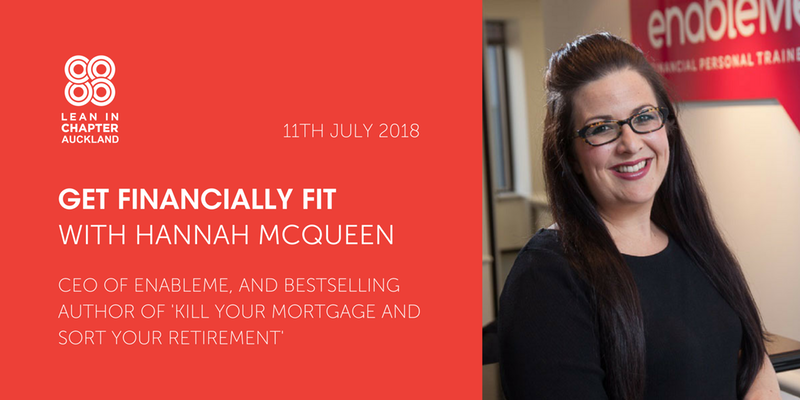 We are hugely excited to welcome the bestselling author of 'Kill Your Mortgage & Sort Your Retirement', and founder and director of independent finance personal trainers enableMe, Hannah McQueen. Hannah's unique approach to managing your money emphasises your psychology of spending and the role money plays in your relationships. Hannah does not shy away from the obstacles we all face in getting ahead. Instead, her clever tips on cutting day-to-day costs will enable you to build a cash surplus so you have extra money for that first home. Her simple framework to calculate your retirement costs and practical solutions to sort retirement are a relief. Imagine if you could pay off your mortgage in ten years instead of 25, while still having a life! It's not too late for anyone - Hannah will set you on the right track. Hannah features regularly on top-rating TV show Fair Go, helping people make substantial savings on their mortgages, and is also the personal finance expert for Radio Live, NewsTalk ZB, and Breakfast TV. She has a regular interview with Mark Sainsbury for Radio Live, a weekly interview with Andrew Dickens on Newstalk ZB, and she appears on the Breakfast (TV ONE) show monthly. She is also a casual contributor to the NZ Herald, Stuff, and NEXT magazine. We are delighted to invite you to an evening of drinks, canapés, and a masterclass in getting your finances in shape. Hannah will take your questions at the end, sharing her wisdom and experience with the group.